Most guests who visited Disney-MGM Studios, now Disney’s Hollywood Studios, in the early years remember that several feature length animation projects, including Lilo & Stitch, Mulan and Brother Bear. However, recalled with less frequency are the other television and film productions that shot at the functional Florida studio. Shows such as Wheel of Fortune, Adventures in Wonderland, Thunder in Paradise, Let’s Make a Deal, and the All-New Mickey Mouse Club all filmed on the lot. One of the game shows to call Disney-MGM Studios home on a more permanent status was Ed McMahon’s Star Search. From 1992 through at least the 1994 season, the show was filmed at the studio’s Soundstage 2. Plans called for the show to move from Los Angeles to Walt Disney World for Star Search’s tenth season. In its first year in Florida the production schedule called for the taping of 156 shows, with five half hour episodes being filmed for weekdays and an hour-long weekend edition. The talent search showcase would uncover talents likes Beth Hart, Lizé, and Britney Spears, who would stick around Disney-MGM Studios to film the All-New Mickey Mouse Club, also known as MMC. 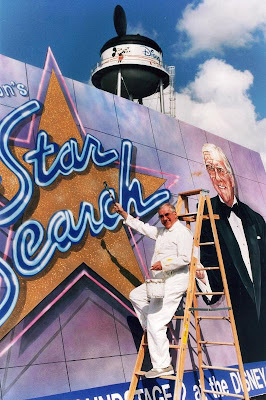 Stepping back to 1992, Ed McMahon was so excited about his new digs that he even helped set up the advertising campaign at Disney-MGM Studios! It's like a completely different park when we look back to those days when real production was at the forefront of the Studios. Sadly, it seems so distant now. I agree with Matt that it was such a different place then...I've been nostalgic for it lately! Matt, I know there are some people that would argue that Epcot is the park that has changed the most since it opened (and there are merits to that point of view), to my mind the Studios has definitely gone through a total personality shift. Zanna, seeing the celebrities wandering around the Studios was so much a part of the allure and glamour from the park's formative years.